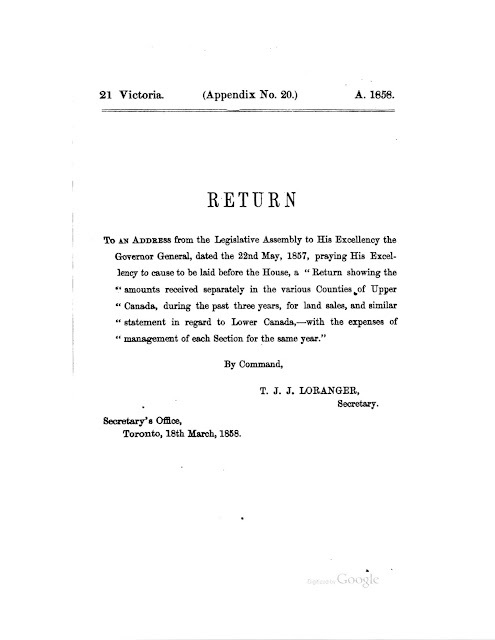 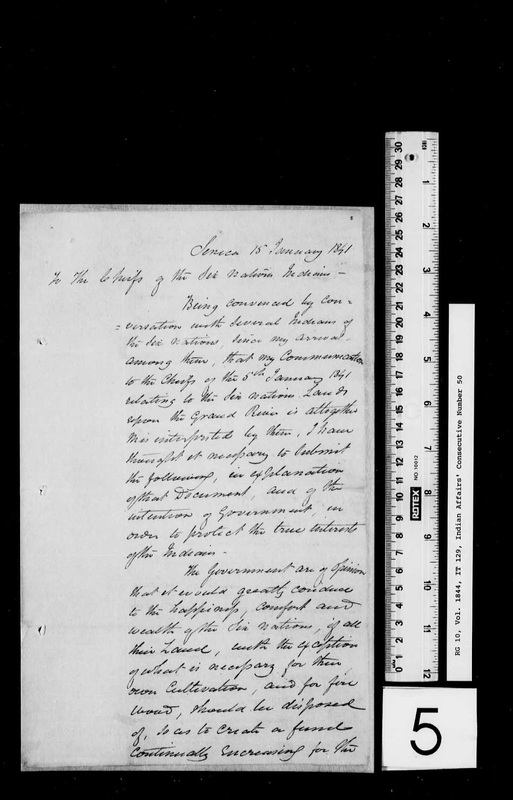 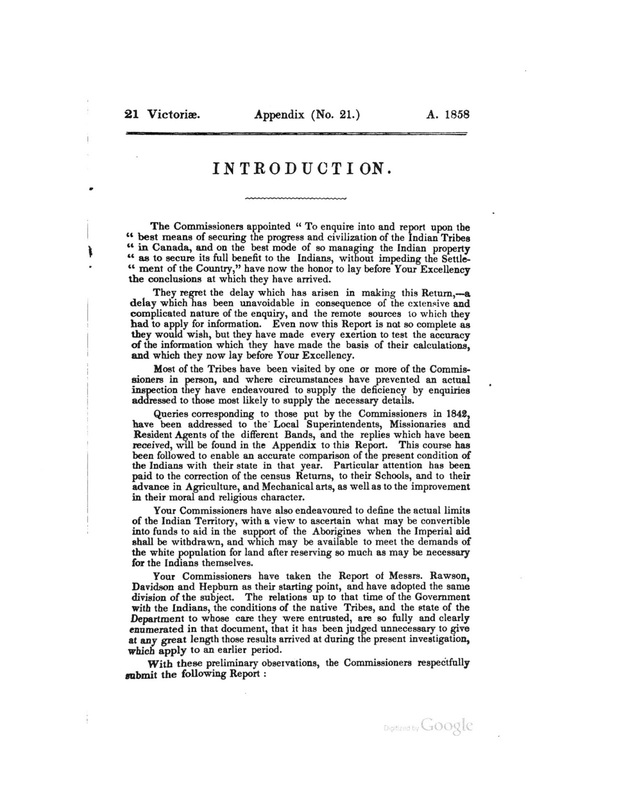 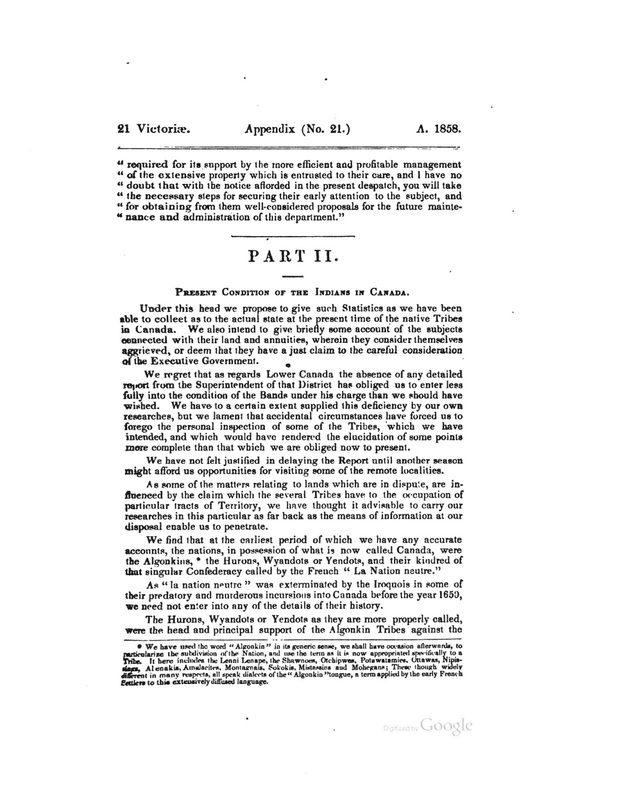 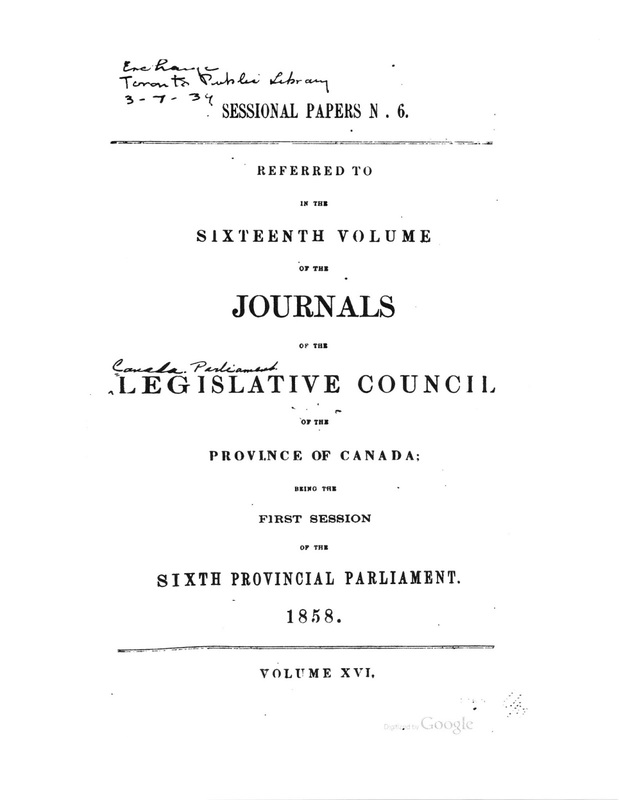 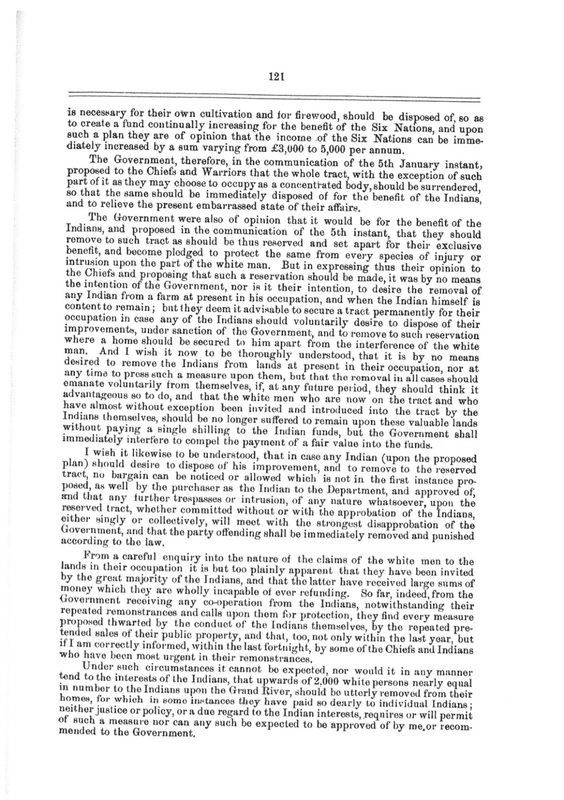 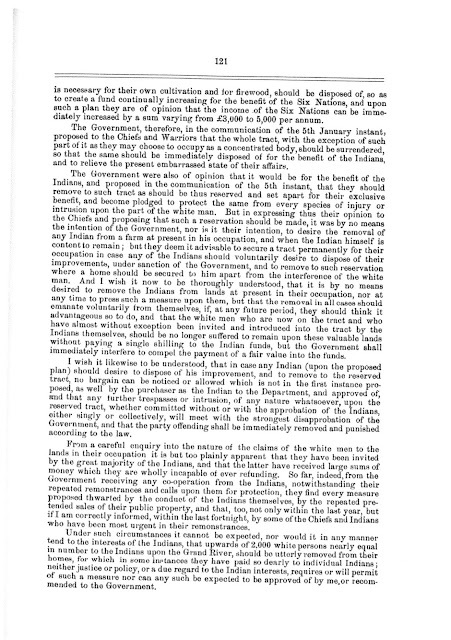 The Federal Government has stated on a number of occasions that it stands by the Surrender of 1841. 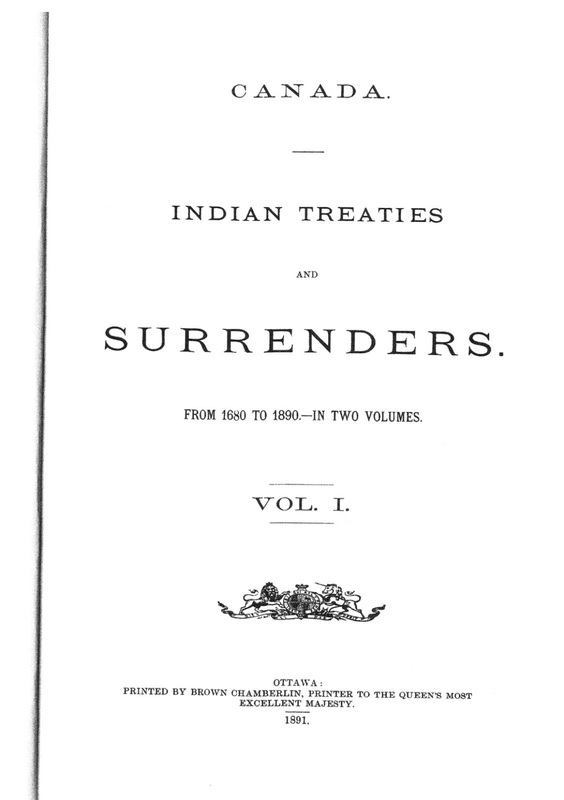 That being the case, it will be important to see and assess just what that surrender entailed. 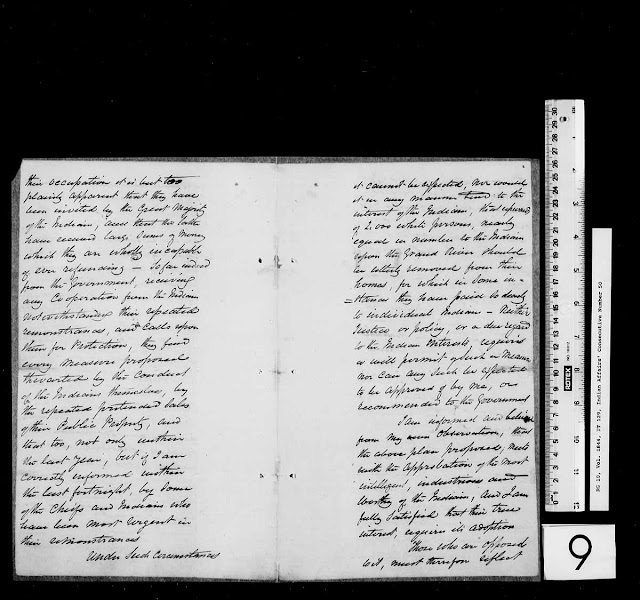 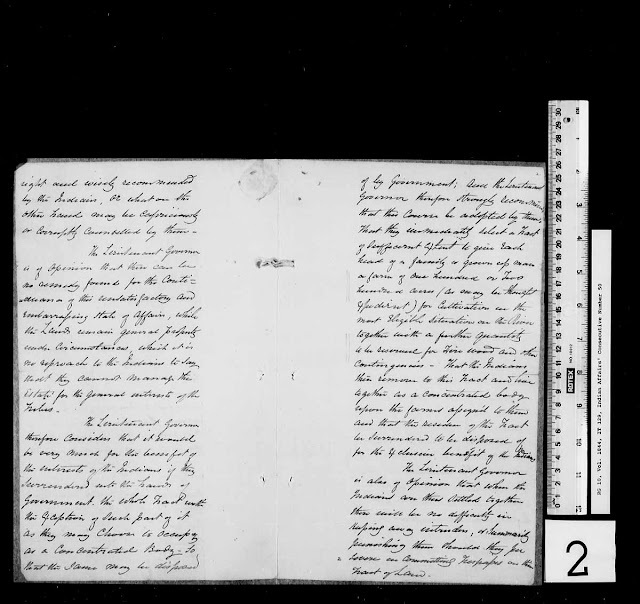 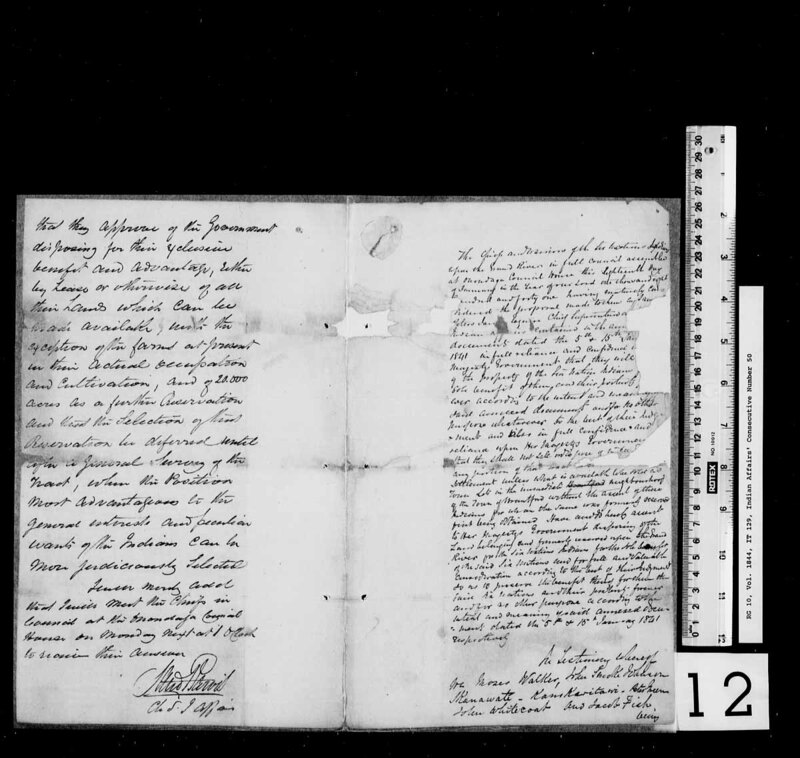 For this purpose I have appended here all 14 pages of said surrender, followed by a typed transcript which is considerably easier to read since most handwritten documents can be trying on the eyes as one attempts to read handwriting from 170 years ago. (LAC, R216-79-6-E, Surrender by the Chiefs of the Six Nations Indians of certain Lands to Her Majesty in Trust for the Use of their Tribes - IT129, Online MIKAN no. 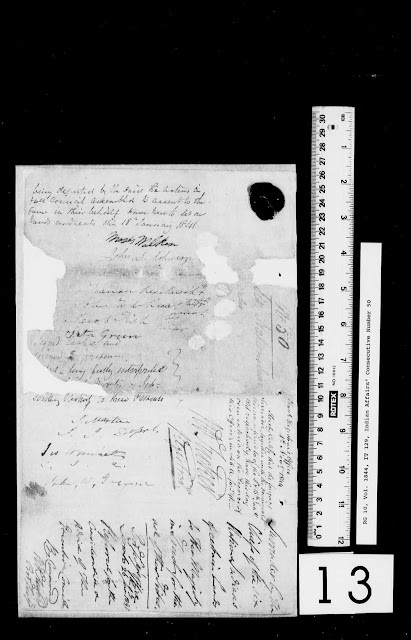 3963846). 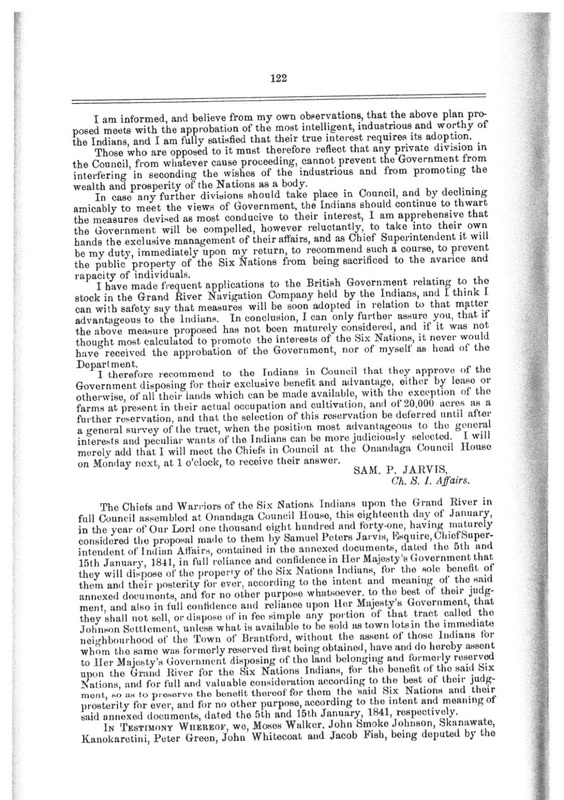 The testimony for the information below is from David Thorburn the Superintendent of Six Nations, and Messrs. Nellis and Elliot Anglican ministers at Six Nations. 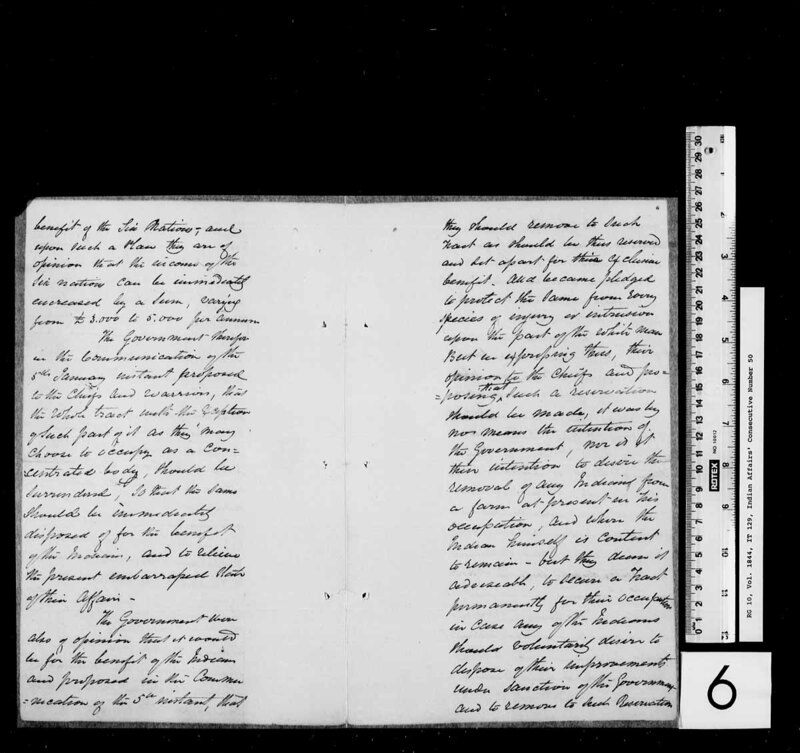 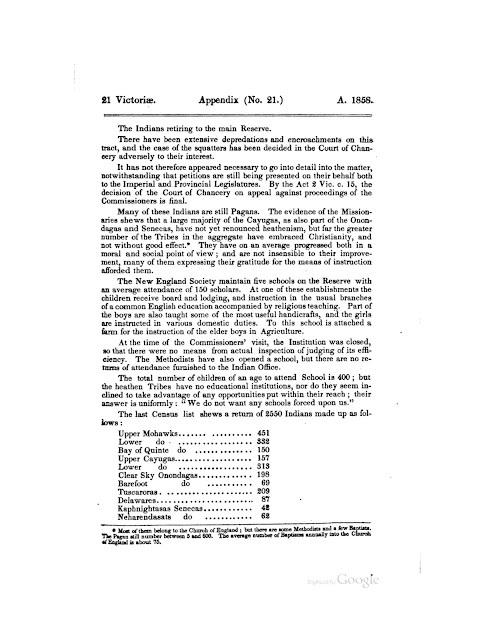 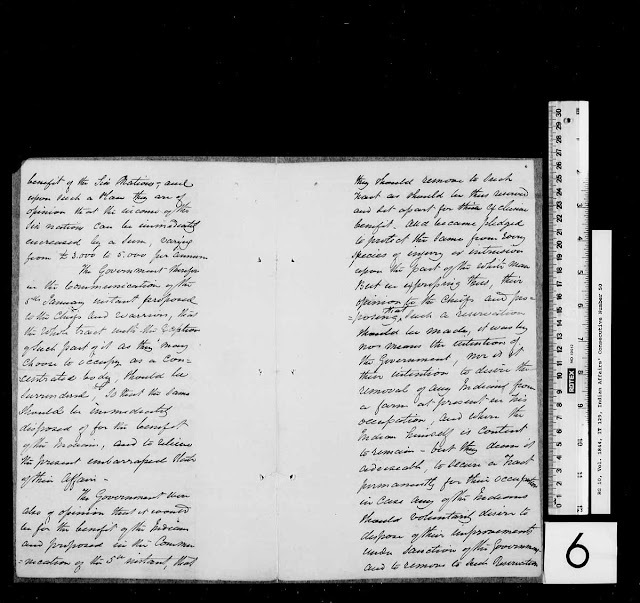 If there is any bias in the data it is not apparent, and all of the information included herein tallies with the original records in the RG10 Indian Affairs records that the present author has reviewed. 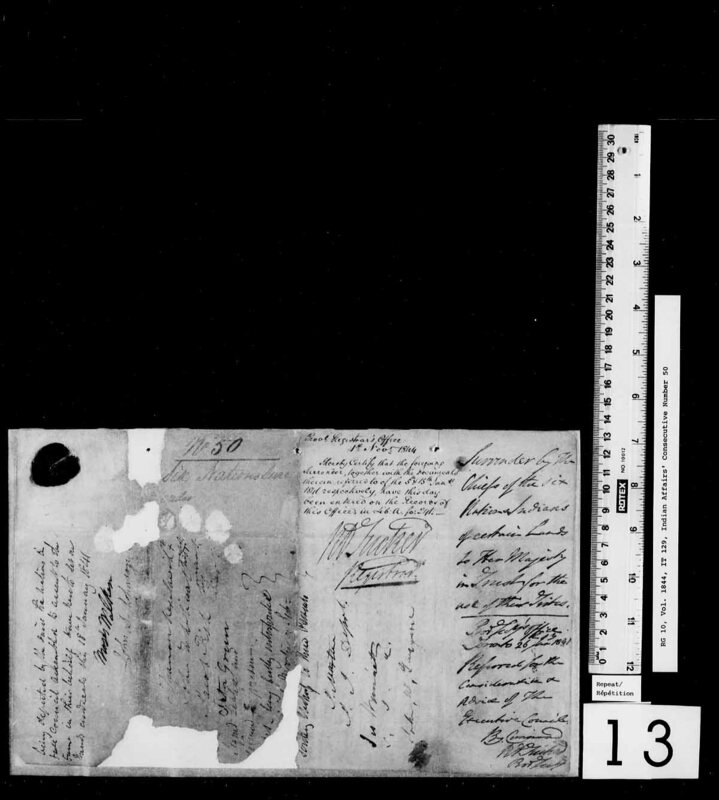 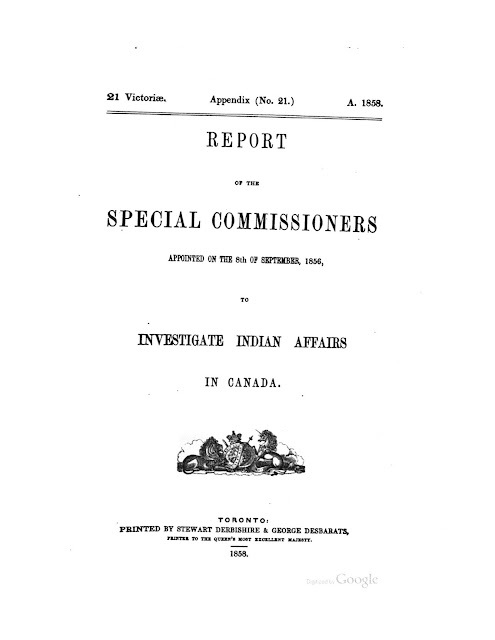 The key question to ask here is IF there was discontent among the Chiefs about what lands were and were not surrendered during the 1840s and earlier, why is there nothing whatsoever in the records that reflects any concern, or perception that they were misunderstood or hard done by. Nothing. 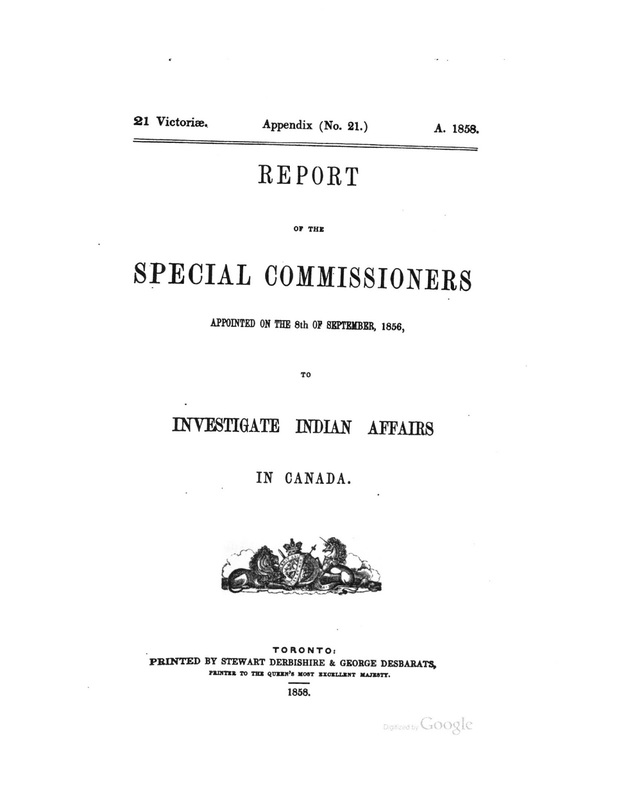 Then in the 1980s a land office is established at Six Nations and the goal is to see what might be gained by contesting the wisdom of their ancestors, and establishing a series of claims for various parcels of land. 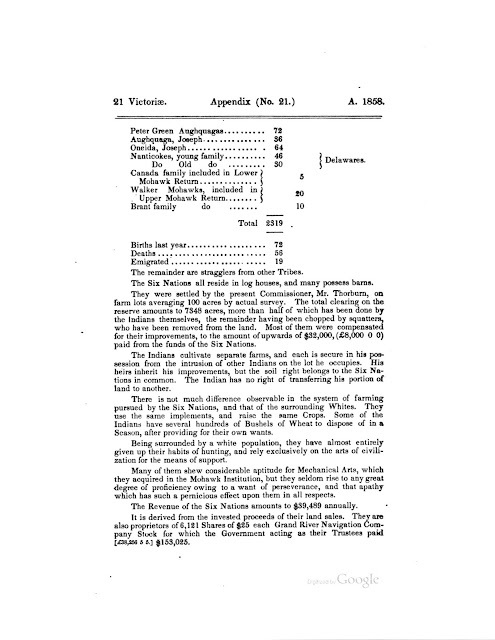 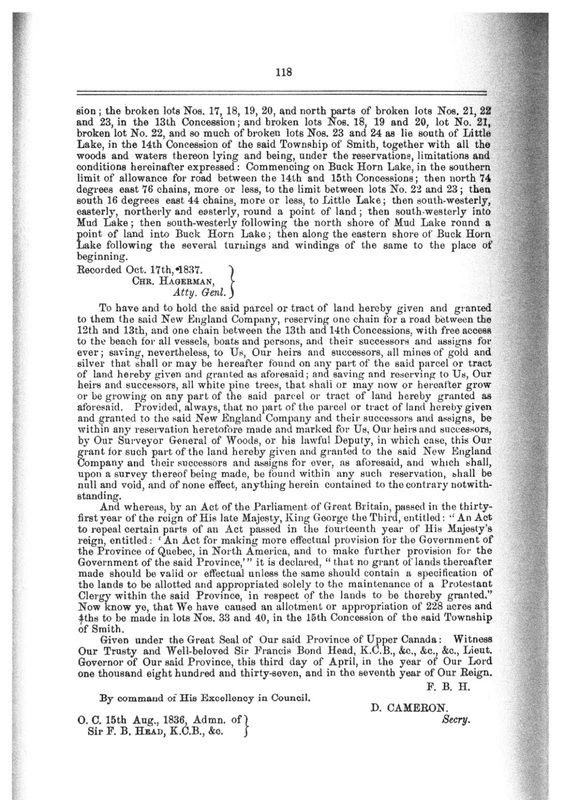 Anything I have seen in the way of claims for land are based on an incomplete reading of the record. 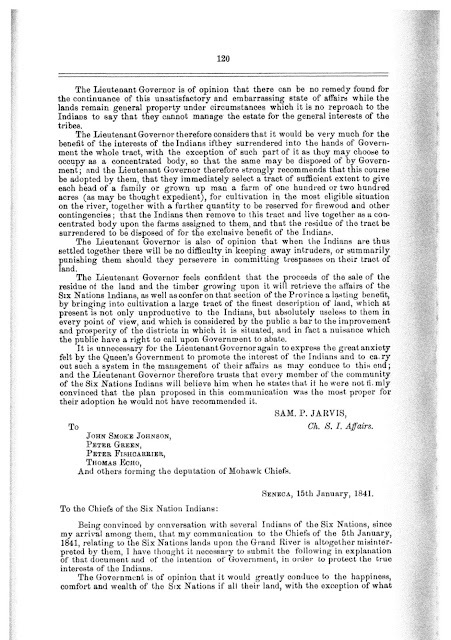 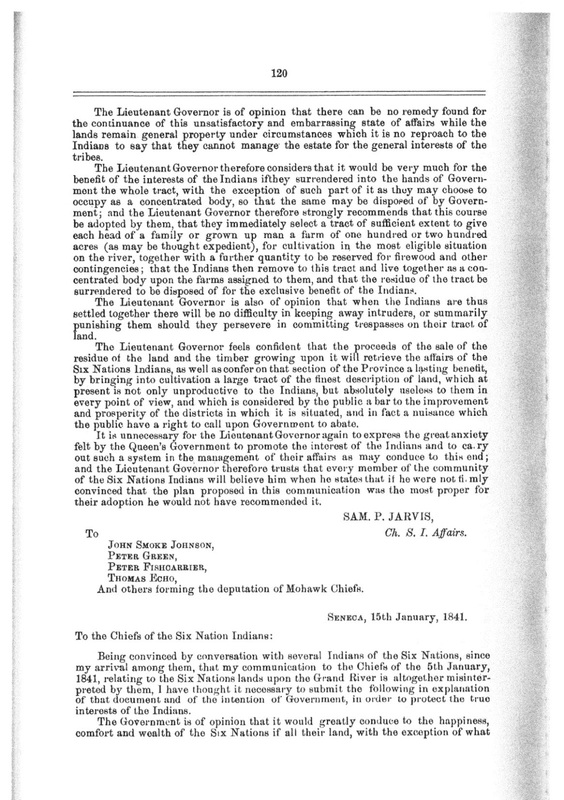 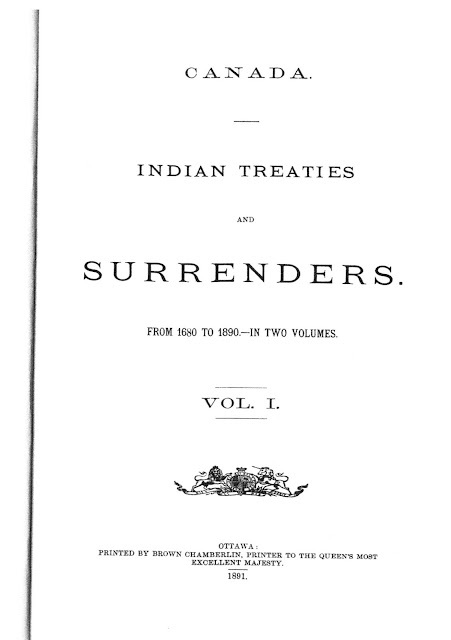 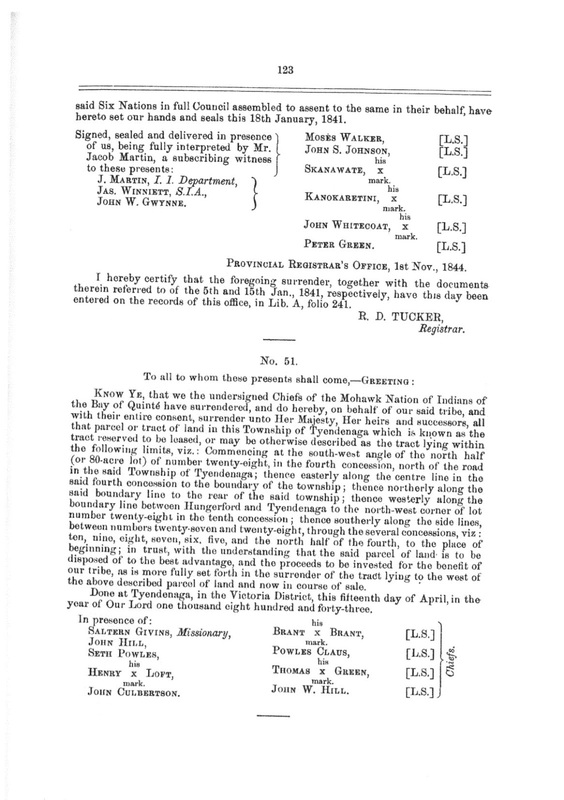 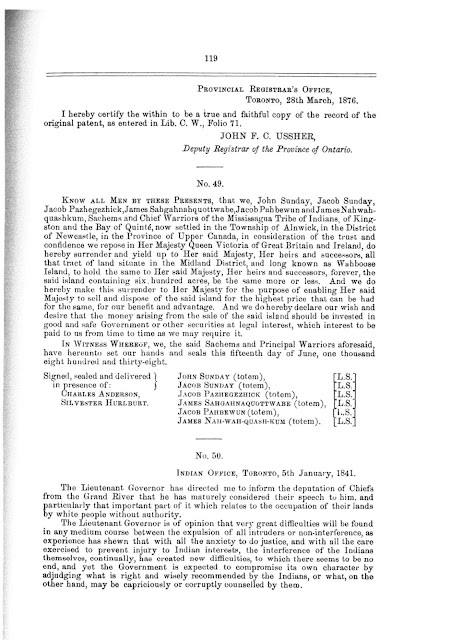 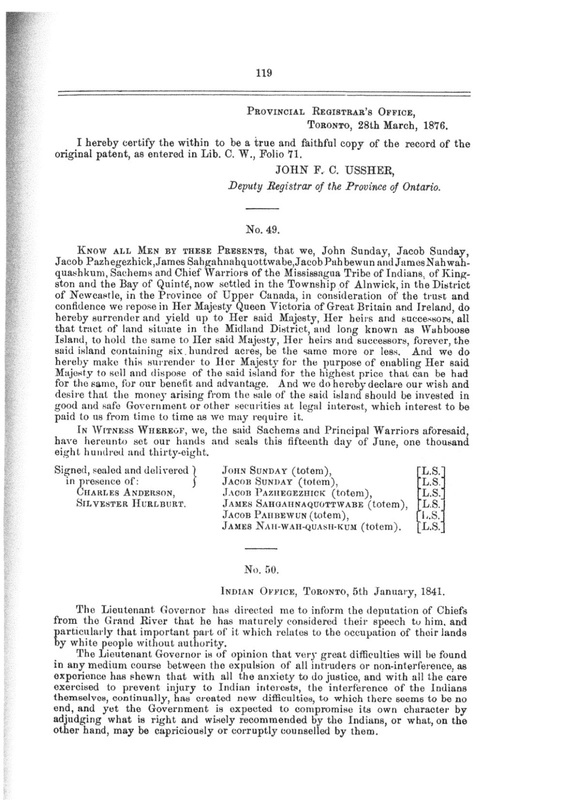 There is NOTHING to suggesting that the Chiefs were unhappy about a surrender which was reviewed repeatedly in Council throughout the 1840s, although it took until 1849 before they receded to the 1841 Surrender and the Minutes of Council and the signatures and marks of all the Chiefs present at the time reflect their wishes as recorded by the documents now found in Library and Archives Canada in Ottawa. As far as I can determine, the land researchers (P.M., and L.B.) have agreed that any outstanding issues are not about land surrenders, but about trust fund monies. 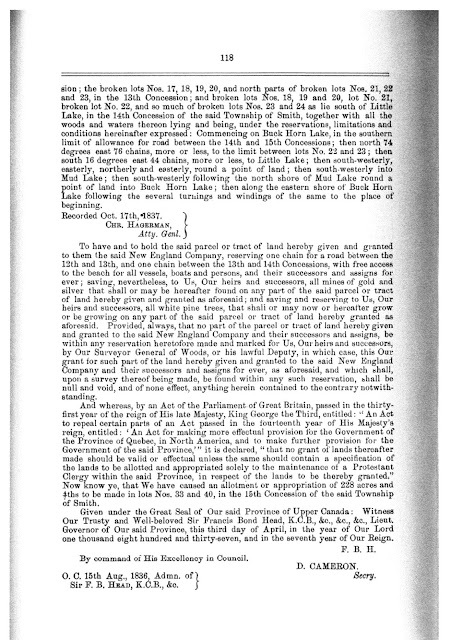 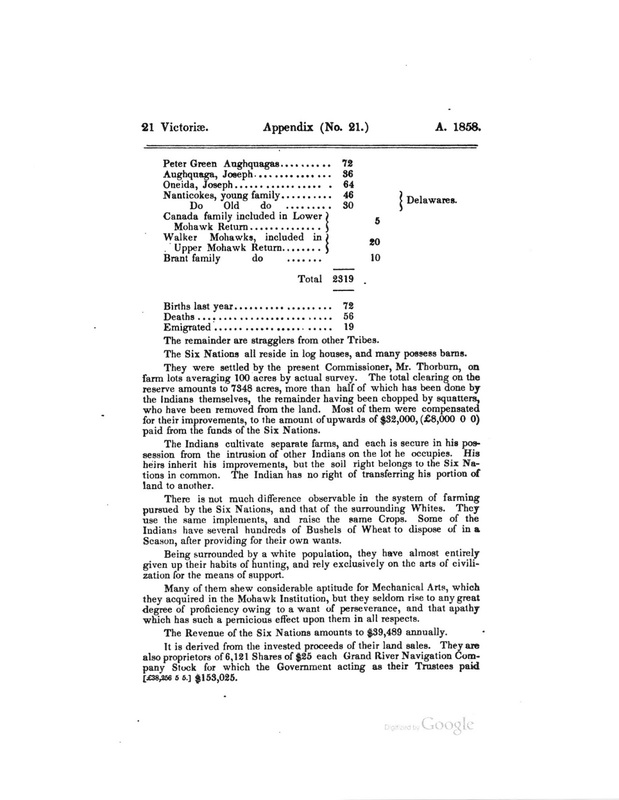 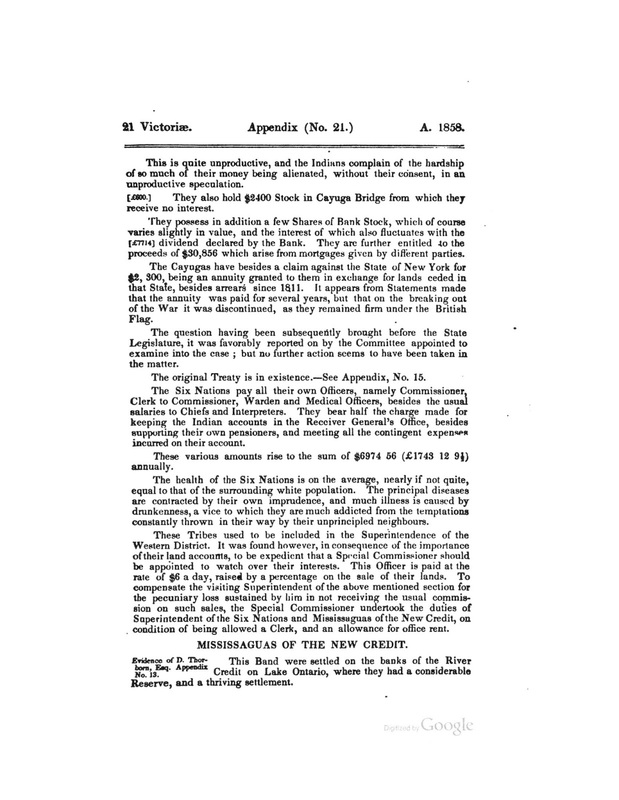 Particular sore points are the possible misappropriate of funds by one official; and the poor investment advice given such that they would put all their eggs in one barrel and invest in the Grand River Navigation Company. 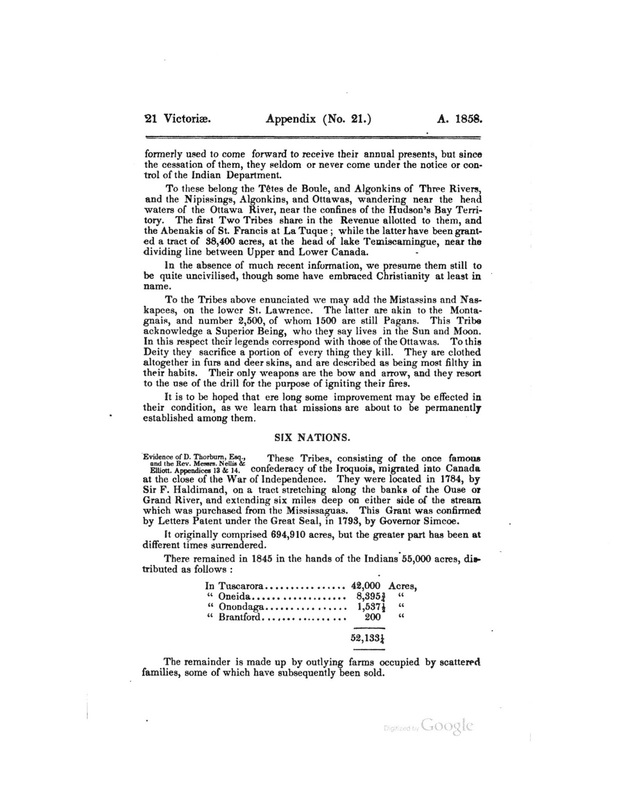 It was Six Nations that took it on the chin and lost all when the company went bankrupt. 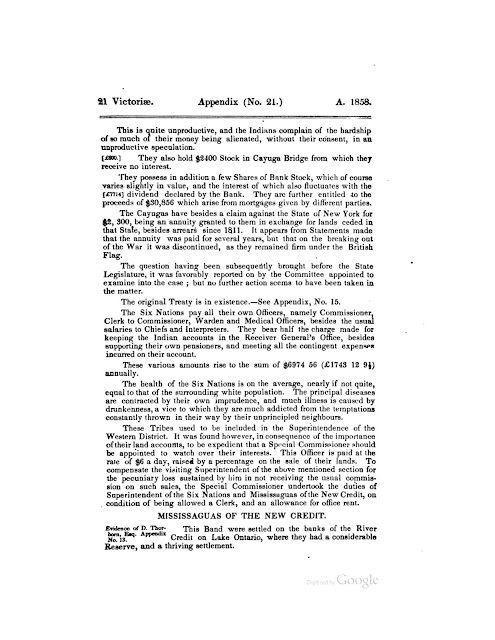 There is definitely something "fishy" about this matter, although it remains to be see whether 150 years later the statue of limitations would allow for any examination of this issue at this time. For the record, I consider the trust fund matter to be a legitimate concern based on the documentary evidence I have seen.